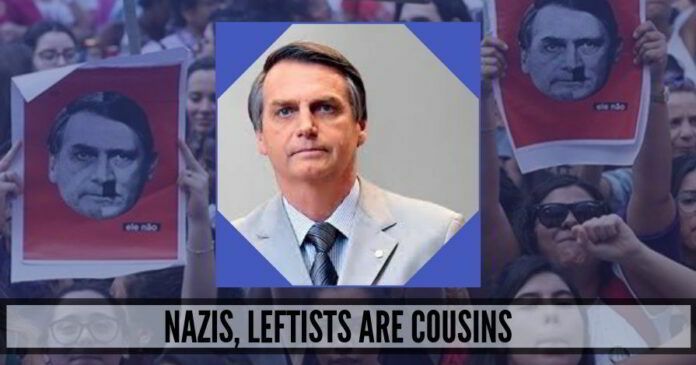 “There is no doubt” that Nazism was a leftist movement, Brazil’s Rightwing President Jair Bolsonaro recently said. This will surely rankle the Left-liberal establishment which has long presented the Nazis as Rightists. Anything near the truth rankles them anyway. After a visit to Israel’s Yad Vashem Holocaust memorial and museum, he contradicted the information on the museum’s website which termed the Nazi movement began as Rightwing. Bolsonaro pointed out that the Nazi party’s name was the National Socialist Party of Germany; it was actually the National Socialist German Workers’ Party, but that doesn’t lessen the thrust of his argument. Reuters tended to challenge the assertion, saying, “Despite their name, the Nazis followed a fascist and anti-Semitic—rather than a socialist—ideology.” As if anybody anti-Semitic can only be a Rightist and never a Leftist. This, by the way, would be the standard liberal response to Bolsonaro’s assertion. The counter-assertion is patently wrong. Let’s begin with the beginning, with the prophet of the Left himself. In the essay ‘On the Jewish Question,’ Karl Marx wrote: “Let us not look for the secret of the Jew in his religion, but let us look for the secret of his religion in the real Jew. What is the secular basis of Judaism? Practical need, self-interest. What is the worldly religion of the Jew? Huckstering. What is his worldly God? Money.” This is certainly not a multicultural manual. So, how could these mammon-worshipping creatures be redeemed? Marx’s answer was simple: “In the final analysis, the emancipation of the Jews is the emancipation of mankind from Judaism.” Hitler tried that only—‘emancipating’ mankind not just from Judaism but also from the Jews, millions of them! The hallowed encyclopedia describes the growth of the party: “Over the following years, the brothers Otto and Gregor Strasser did much to grow the party by tying Hitler’s racist nationalism to socialist rhetoric that appealed to the suffering lower middle classes. In doing so, the Strassers also succeeded in expanding the Nazi reach beyond its traditional Bavarian base.” In the 1934 purge, Gregor was liquidated whereas Otto managed to escape to Canada. Notice the smooth, seamless movement of the Strasser and Goebbels between Nazism and socialism. We need to mention here that this was possible primarily because both ideologies have a great deal in common; and commonalities pertain to fundamentals, not just accidental features. Both are collectivist: the collectivity is supreme and its powers over the individual absolute. Since the collectivity is supreme, its concrete expression, the state, is all-powerful. It ought to be, otherwise, how would it exercise its supremacy? Consequently, there is little regard for democracy, less for civil liberties, and least for individual freedom. No ideology other than that of the ruling clique is even allowed to exist; elections, when they are, are a farce. Purges are frequent, concentration camps an integral part of the system. The media, literature, cinema, arts, culture—everything is controlled by the state. Even science has to be subservient to the ruling ideology. In his book, Comrades: Communism: A World History, Roberty Service wrote, “Stalin later also laid down that Einstein’s theory of relativity was ‘bourgeois mystification.’ Hitler did the same but held back from persecuting German scientists—so long as they were not Jews—who followed in Einstein’s footsteps. Stalin treated any support for relativity theory as conniving at the overthrow of the Soviet order. When Beria pleaded after the Second World War that Soviet physicists needed Einstein’s equations in order to make a nuclear bomb, Stalin made the magnanimous concession: ‘Leave them in peace. We can always shoot them later’.” So much for ‘scientific’ socialism. Previous articleIs the West looking at Modi through India’s Left-Liberal lens?